1 bedroom, living area and 6’ porch. 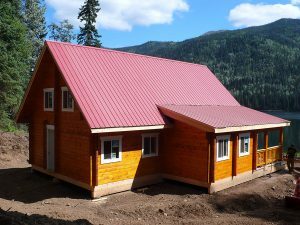 Roof system (recreational, without building permit): Consisting of 2”x 8” precut rafters, fascia boards, trim, sheet metal roofing, R-22 fiberglass insulation, , 3/8” plywood as inside sealing, vapor barrier, tarpaper and miscellaneous screws and nails. Other R-values are available upon request. Doors and windows (recreational, without building permit): Steel insulated man door for the entrance door, pine door for the interior and vinyl sliding windows with mosquito screen. Doors and windows come with outside and inside trim and miscellaneous screws and nails.